Here is the breakdown of the party proportional vote in Sunday's House of Representatives election, national totals. Prime Minister Abe Shinzo and the LDP have been proudly noting that the party received over 1 million more votes than it did in the victory of 2012, when it received 16,624,457 votes. 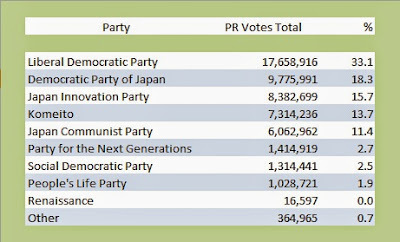 As for the oppostion parties, the DPJ raised its total by 140,000 votes, having received 9,628,653 in the 2012 election. The Japan Restoration Party and the Your Party together received a total of 17,507,814 votes in 2012. In 2014, the remnants of these two parties, the JIP and NexGen, received a total of 9,797,618 votes. Who really get to crow, though? The Japan Communist Party. It received nearly 2.4 million more votes than it did in December 2012, a two year increase of 64%. Later - An earlier version of this post stated that the increase of the JCP proportional vote was 62%. Sorry.